The Holiday Season is a joyous time of year. Kids and families look forward to spending time together, opening gifts, and snuggling on the couch watching classic Christmas movies. However, one student at Eleva-Strum was facing a Holiday Season that wasn't going to be as joyful as he would like. His mom serves in the U.S. Army and is deployed overseas and wasn't going to be home for Christmas. He even asked Santa if he could bring her home. That was the one thing he wanted. This is a very special gift for a very special student. Please draw a name from a hat and have that student open the gift! As you can imagine. All of the students were excited about the opportunity to have their name drawn and receive this unexpected gift. Mr. Kempf reached into the bucket, pulled out a name, and announced....... ROY! An audible YES! was heard from Roy as he hurried forward to receive his gift. 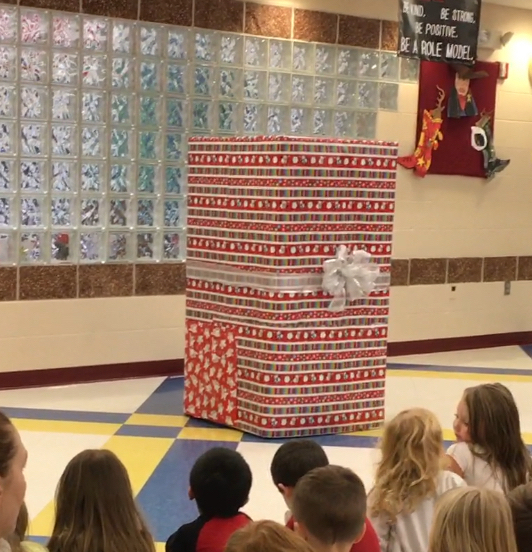 With much anticipation he ripped the bow and paper off to reveal....... a box. But, wait. This was a special box that seemed to have a door on it that could be pulled open. Roy gently pulled open the door in cautious anticipation of what was inside. The next thing we all saw was Roy disappear into the box, but what we all heard brought tears to nearly everyones eyes. MOM!!!! Merry Christmas, Roy! Thank you Sergeant 1st Class Ashley Huiras for letting us all in on your special day with your Son and reminding us all what's important in life. And thank you most of all for serving our Country. We can see the sacrifices that you and your family make and we thank you for that. Watch the gift opening by clicking on this link. Please note that WEAU 13 was there as well. Tune in and catch the story tonight.